You are here: ▶️ Home » Flat Roof Repair » Torch Down Rubber Roofs » EPDM & Modified Bitumen Torch Down Rubber Roofs – Which is the Best? Below are images of EPDM rubber roofs and Modified Bitumen Torch Down Rubber roofs that are about ten years and older. Notice that Modified Bitumen rubber roofs outlast EPDM rubber roofs in terms of durability and appearance. 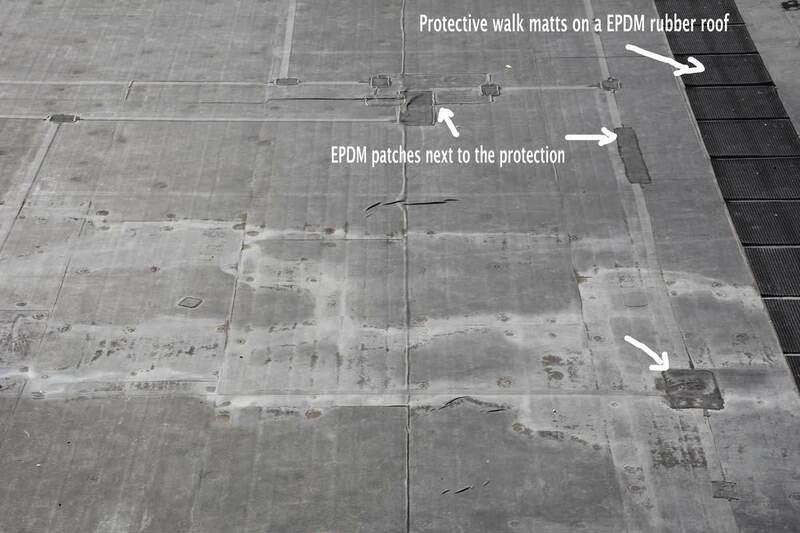 EPDM is not designed to withstand the repeated foot traffic that is necessary for home maintenance because it is too thin, and can be easily damaged. We highly recommend the 2 Ply Modified Bitumen Rubber Roof System because it is 5 times thicker, with a stronger rubber composition that will not erode with any kind of maintenance activities. EPDM rubber roof adhesives and caulkings fail because they cannot withstand the surface heat for extended periods of time. 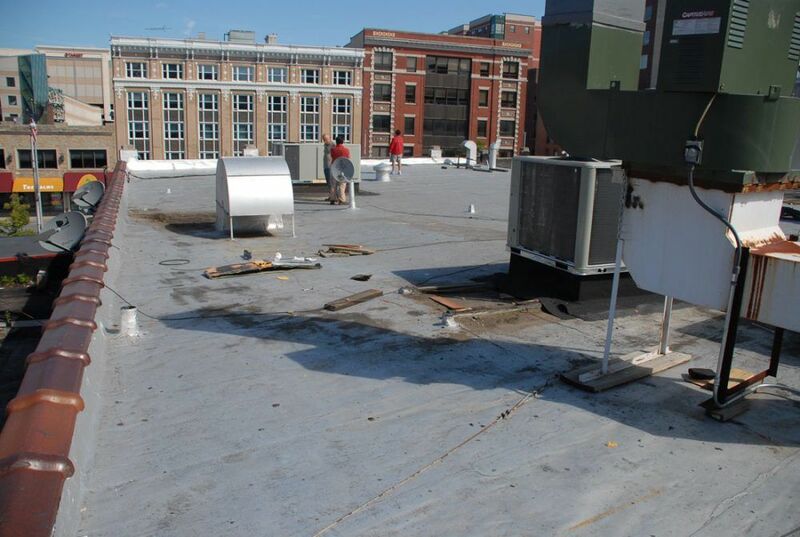 An EPDM roof surface can reach temperatures upwards of 160° F.
In the image, there is a history of multiple repairs on this EPDM roof. 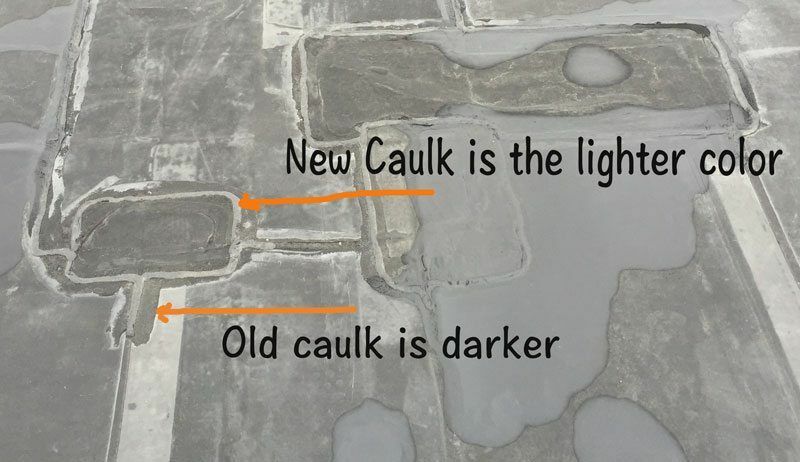 The dark-colored caulking is a sign of old repairs, while the lighter colored caulkings are signs of newer repairs. 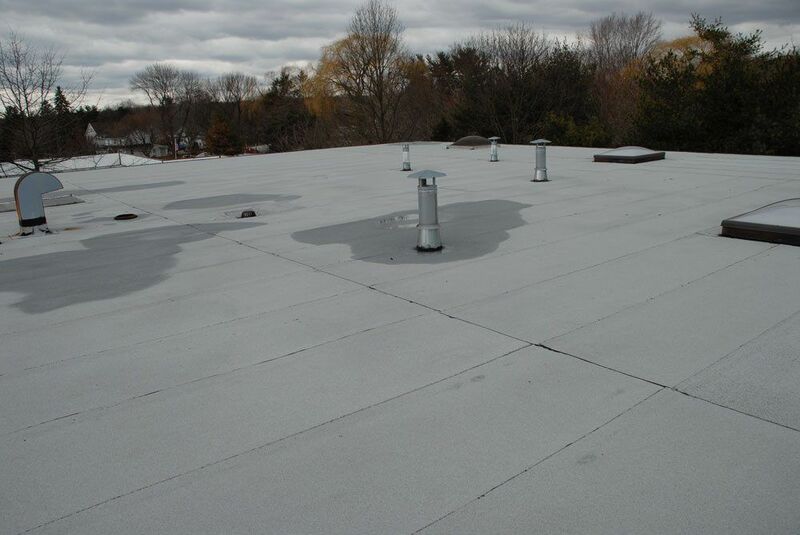 Neither the EPDM rubber patches nor the caulking, are a permanent solution to a worry-free or leak-proof roof. Modified Bitumen Torch DownRubber Roofs are heat-welded at the seams. 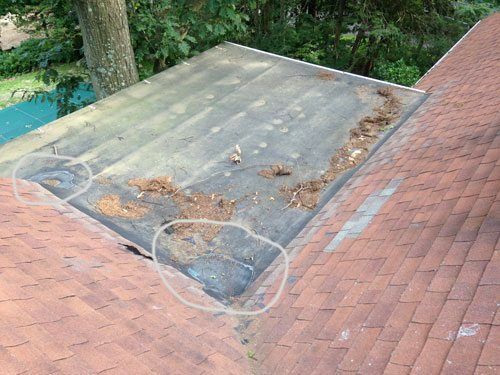 This roof was installed by Commercial Roof USA over 14 years ago, and as of this writing, there are no signs of repair patches. This 25-year-old 2 Ply Modified Bitumen Torch Down Rubber Roof, coated with aluminum asphalt paint, which is meant to protect the surface against harmful UV rays. It has had many years of scattered debris, foot traffic from a rooftop a/c and ventilation units being serviced, yet, there is no indication that repairs have ever been needed. 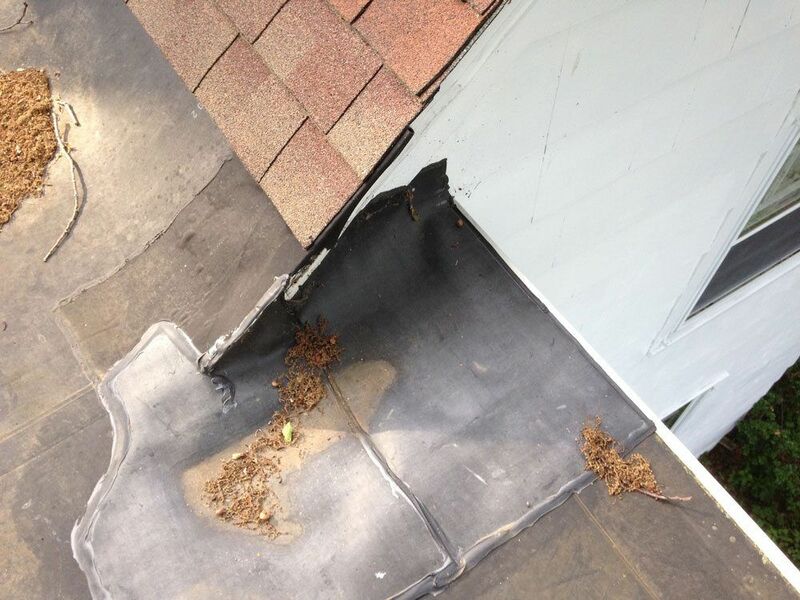 This type of roof has withstood maintenance and service activities throughout its 25 years. Today Modified Bitumen Torch Down Rubber Membranes are offered by manufacturers in both a plain surface and a surface coated with ceramic granules.